Well, I Didn’t See This One Coming. Congratulations! You’ve just been diagnosed with Type 2 Diabetes. Welcome. You are going to learn SO MUCH stuff. And as a lovely parting gift from your doctor for allowing him to share this exciting news with you, here is you very own, brand new glucometer to test your blood sugars, complete with meter, 10 lancets and 10 free test strips. A “value” of over $100…now yours, absolutely FREE, just for playing “Hey, Why Am I Always So Darn Thirsty?”. Then the doctor disappears, nurse gives you your first little “prick” to show you how to “do it”, packs up all of your new stuff into a plastic bag and schedules a 3 month follow-up. Is that the way it happened for you? Yeah, same for most of us. Anyway, now that you’re “diabetic”, strap yourself in for the learning curve (it looks like a roller coaster at Six Flags). You are about to get a crash course on everything related to being a Type 2 Diabetic from education classes with a “diabetes educator”, learn really important stuff about nutrition ( I STILL don’t get that whole “exchange” thing ), warning signs, explanations and examples of what happens when your blood sugars are too low or too high. You’ll get books, and manuals, infographics, phone numbers, different doctors or professionals to have on your “care team” Did you know you are even going to have a dentist and an eye doctor on it? 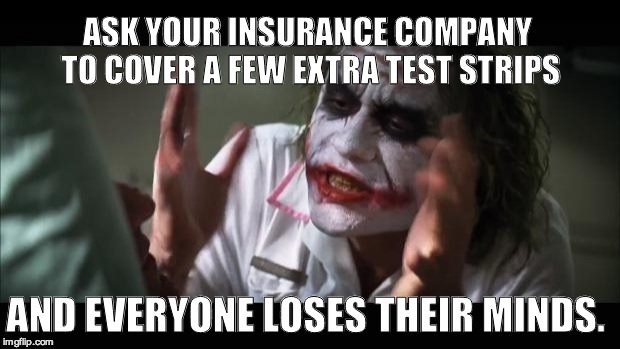 Just who’s NOT going to be billing my insurance company? So, I thought this was FREE? The one thing you didn’t get with all of your “free” stuff ( actually paid for by your insurance company ), was a “price list”. “Why would I need a price list?” you might ask. Well because diabetes is big BUSINESS and there TRILLION$ of GLOBAL DOLLAR$ to be made by the same companies that either bill or pay for $425 for an aspirin while in hospital. You think that’s bad? You ain’t seen nothin’ yet. Wait until you need to go out of pocket for test strips. Be careful to not have a stroke – remember, as a diabetic, you ARE at risk! Alright, let me prepare you for it first. You’ve kind of been in this spot before. Remember when your “old” computer printer crapped out and you went to Wal-Mart to go buy a cheap one…and WOW, look at how cheap they ARE! Such a deal. You almost wanted to buy TWO they were so cheap (c’mon, they’re printers not big jars of peanut butter 2-for-1…oh wait I DO need peanut butter ). You were so happy and proud at all the money you saved. You hurried right home, plugged everything in, ran a test page – LOOKS GREAT – then got to work printing stuff out. Then….it STOPPED! After only what seems like 10 pages, it ran out of ink. The kid at Wal-Mart didn’t know that the manufacturer only puts enough ink in the printer to get it home and get you excited. The reality now hits – you have to go get an ink cartridge – but hey, how expensive can an ink cartridge cost for a $30 printer? No problem, right? How can a BLACK ink cartridge cost almost as much as my printer? You tell the clerk at the office supply store ( or Wal-mart again ) “You need to check the price in you computer. It MUST be wrong!” After 10 minutes of “huh?”, you realize you have been “suckered”. But don’t feel too bad about it…it happens again when you get your new glucometer. This Is Not MAGIC…BLACK MAGIC…This Is Only Math! Let’s say your ink cartridge – just the black one – cost you $30. Now, let’s say you’re able to find 50 test strips that work with your monitor for the same $30 – not an out of the ballpark range ( it depends on your meter – which was FREE, remember? ). Now your ink cartridge says it will last for up to 250 pages. Your test strips will last for 50 tests. How long is it going to take you to print out 250 pages ( be real here). 2 months? 3 months? Longer? Well, on a per page basis, your $30 ink cartridge is going to cost you about 12 cents per page and let’s say that is spread out over 3 months. It’s not likely you’re going to be using your printer everyday, right? Now, let’s assume your doctor wants you to test your blood sugars just 3 times per day ( maybe even just 2 times ). You have a box of 50 strips, and you will use them up in just 16 days (not 3 months like the printer). Your test strips cost you $0.60 cents per strip – or $1.80 per day. I’m not kidding on the per strip cost. That is a pretty common number. Let me ask, do you use your printer 3 times per day? That cost would be only $0.36 for 3 pages if you did. $0.36 per day for paper or $1.80 per day for test strips? Your ink cartridge is beginning to look pretty good right about now, huh? See, it’s math, not magic. Sorry, but we haven’t even gotten to the good part yet. The reality is that as of just a couple of years ago, prices ranged from 15 cents a strip, to $9 for a box of 50 strips (18 cents each) up to $1.50 per strip. As I showed in the example, a little more than $0.60 cents a strip is not uncommon. People with diabetes want to show the medical and insurance industry that the high price of test strips quite often meant they were not able to consistently monitor their blood glucose. 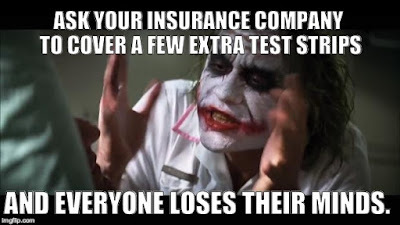 That was true both for uninsured people and insured people, who said their insurance policies often did not cover strips, or covered fewer than the doctor prescribed, or covered them with a hefty copay. Because they are not testing their blood glucose, some people have said they felt that they were guessing on treatment — and therefore were more likely to encounter the serious complications that diabetes can bring, like cardiovascular disease, nerve damage, kidney disease, eye damage (including blindness), foot damage (including amputation – and I can tell you a LOT more about THAT one ), skin conditions, hearing impairment and Alzheimer’s disease. A recent study in California found that the situation with the pricing of diabetic necessities has become more than worrisome; and that gouging for a profit is not right. At one major retailer, strips went from roughly 33 cents a strip to more than a dollar. The resources now for most cost-conscious diabetics is to shop on the web. One example of savings is a customer gets boxes of 50 strips for about $31.50 per box, including shipping — a little more than 60 cents per strip. According to another shopper, Walmart sells the Relion Prime meter for $16.24 ( 2014) and the strips are $9.00 per 50. That is the best pricing they had found. And just so people know, all of the different brands of meters are required to work within set specifications. The Relion meter in that example is claimed to be just as good as any of the higher priced meters. Obviously, you can see that diabetes is not going to be cheap. Because some diabetics aren’t testing as often as directed, trying to ‘horde” or marshal test strips to save money, the danger of “guessing” was mentioned just above. It is actually so bad that a whole new industry has cropped up…and it’s very possible that you’ve already seen signs nailed to telephone poles or elsewhere say “I BUY TEST STRIPS”…right? Yep…there’s already a “market” for diabetics in need of cash for unused, unexpired, unopened boxes of test strips. Pretty sick, isn’t it? The bottom line is in order to find the least priced test strip, you need to digging around on the internet. It might take some work. Check out the prices of the strips designed for use with your monitor. A good place to start would be this Google Link. Another thing to compare is does the price of test strips for your monitor compare to the price of monitors that are less expensive? Are the test strips priced relative to the monitor? If so, get the least expensive monitor with the least expensive strips. Kind of makes the whole ink cartridge thing seem silly, doesn’t it?